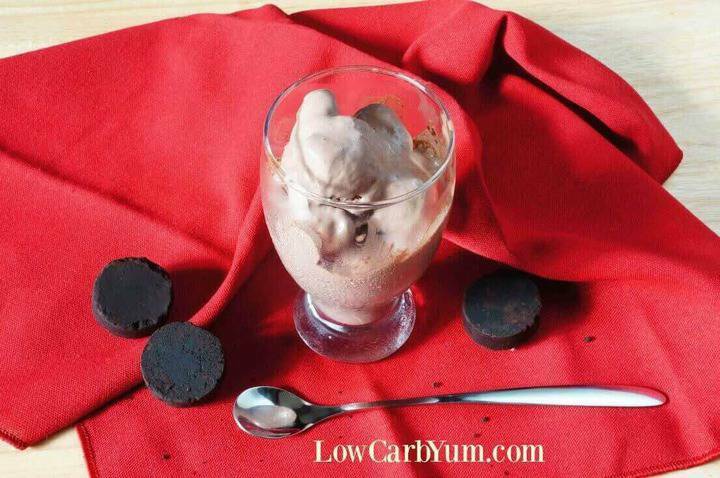 It’s really quick and easy to make thick frozen low carb shakes at home. This chocolate milkshake is a copycat of the famous fast food Frosty. 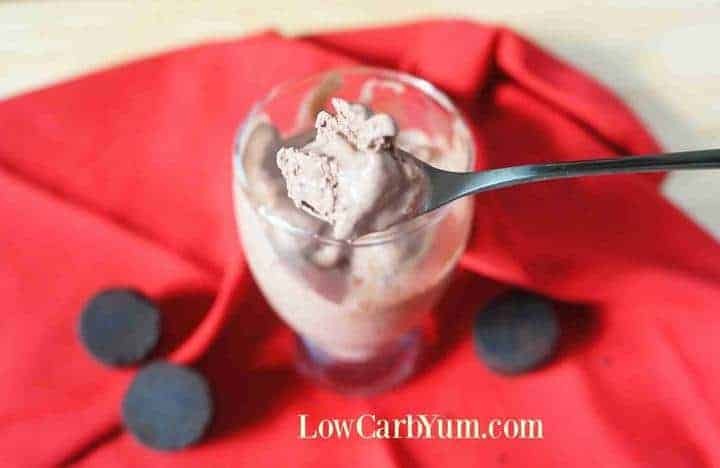 This is a really quick and easy way to make a thick frozen low carb milkshake at home. I was happy with the consistency after putting the mixture in the freezer for about one hour. I made one of these low carb shakes tonight. And, I will be making more to enjoy this summer to help beat the heat. You will not be disappointed with this treat! The consistency is similar to soft serve ice cream. Feel free to tweak the sweetener amount to suit your taste. I felt this had the perfect sweetness for me, but others may want it more or less sweet. The summer weather has finally arrived here in Southern New England. So, it’s the perfect time to enjoy low carb shakes. I do love my sugar free ice cream. But, I miss swinging by the fast food drive-through on the way home to grab a frozen chocolate frosty. 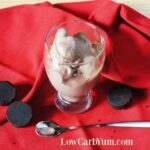 I figured there must be a way to make this thick chocolate low carb milkshake at home. There were a few recipes I found online, but decided to come up with my own recipe. 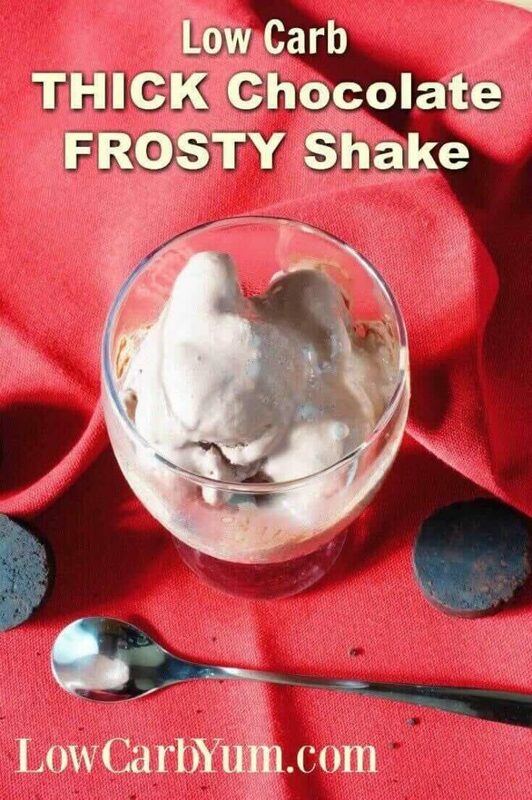 The reason I created my own is because most recipes for a copycat Frosty like this one use nasty ingredients. Typical recipes for this thick milkshake use sugar filled chocolate milk, sweetened condensed milk, and Cool Whip. I’m the only one in the house who eats low carb treats. So, I wanted something that would only make one or two servings in about an hour. The great thing about my thick chocolate low carb shakes is that you don’t need a special machine. To make them, only an electric mixer and a freezer are needed. 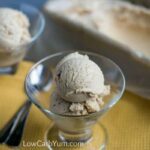 Although I do own an ice cream maker, I chose not to use it for this recipe. Of course, if you prefer, you can always churn the mixture in your machine as it will be much easier. The carbs for this chocolate low carb milkshake are a bit higher than I’d like. So, many times, I’ll eat half and save the other half for later. If you do keep the mixture in the freezer for more than a couple hours, it will freeze very hard. But, you can just let it sit out at room temperature to thaw out a bit before eating. For those who want thinner low carb shakes, I’ve got a few other recipes you can try. My chocolate peanut butter shake whips up in a minute and so does my strawberry yogurt one. To help thicken regular milkshakes and keep carbs low, you can add crushed ice and whip it up in a blender. 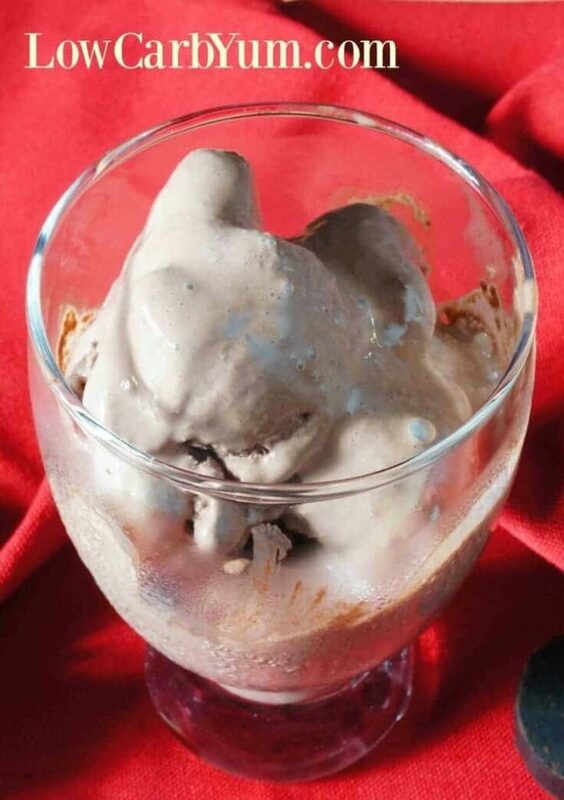 My original recipe for the chocolate Frosty used all heavy cream, but I diluted it with almond milk to cut carbs. Feel free to change up the recipe to suit. In the future, I hope to make a vanilla Frosty recipe. 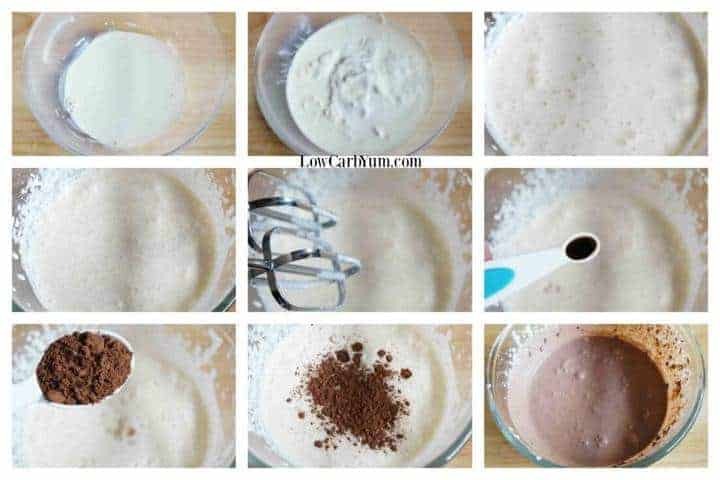 This is a really quick and easy way to make thick low carb milkshakes at home. The creamy chocolate milkshake is perfect for cooling off in summer. Start whipping cream with mixer until soft peaks form. Continue beating until stiffer peaks form. After 20 minutes, remove from freezer and stir with fork to break up frozen areas around edges. Keep checking mix every 20 minutes and stir until it’s cold enough and the right consistency. Is there a way to do this by hand? Would it just take longer? It’s best to use an electric mixer to whip up light and fluffy. It’s tough to incorporate that much air by hand. 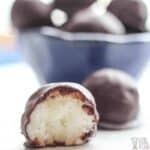 Has anyone had success with using canned coconut milk instead of HWC? I’m dairy free keto, so now HWC for me but I miss my frostys!!! Coconut cream works better than the coconut milk because it has more fat. I was just wondering if the Truvia makes it gritty? I tried using Truvia in my unsweetened ice tea and it’s discusting Even liquid Splenda taste bad Does you or anyone have any suggestions? If the erythritol in Truvia doesn’t dissolve, it can be gritty. Have you tried liquid stevia and or monk fruit? Splenda makes a crystal type Natural version using the stevia leaf but there’s no after taste! They explain that they use Reb D vs the other type which leaves an after taste. It tastes very good, believe it or not! Swerve is great in tea and low carb shakes. Powdered swerve like confectioners sugar is amazing in this! 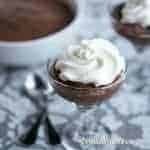 My husband and I are doing keto and I have been having a hard time finding food dessert recipes. This is perfect!!! Just made some and we had to share-doubling next time for sure!!!! I love all the recipes you post! 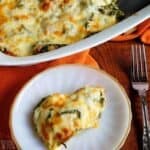 My husband and I are on the keto diet and we have been encouraged to start the Facebook page Keto Low Carb Paradise. 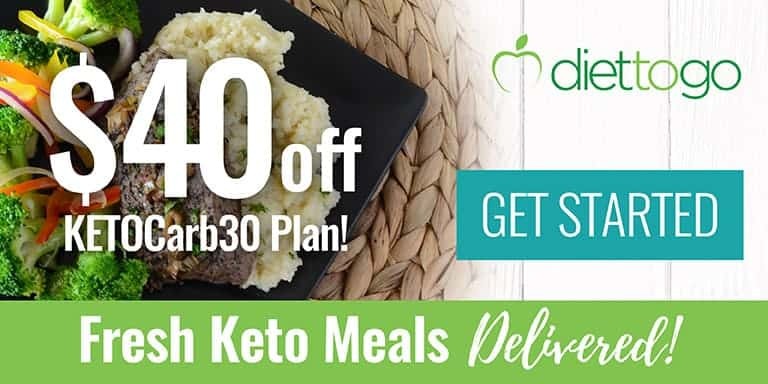 We’ve had great results from the keto diet and continue to refer people to your website often! 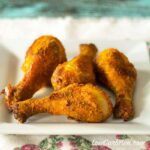 Thank you so much for sharing your wonderful low carb recipes. Thanks for being a loyal follower! I’d love to check out your page if you get that started. Great way to make it quickly! 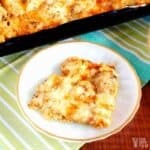 This recipe was so delicious! And it actually does taste like a frosty. 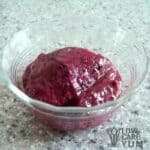 There are plenty “frosty” recipes out there that are disappointing, so thank you for a tasty low carb treat😊 I added a drop of hazelnut stevia. Yum. Love the added hazelnut flavor! Hi Lisa, how about nixing most of the carbs and calories and just use unsweetened Almond or Cashew, or even Hemp milk with your favorite sweetener and flavoring with ice cubes in a blender? I’ve it for years. My shakes are thick and creamy without the heavy cream. The lower carbs milks just don’t freeze as well as cream. Heavy cream is needed to make it a frosty texture. Ice makes it like a slushy. Two different things. The recent recipe conversion may have messed up the numbers. I have recalculated and entered in new values based on the results. You could reduce if you’d like. You may want to add a flavoring extract. 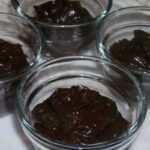 Can I mak without the vanilla extract? Only have regular not surface free? If I use the regular what would carb count be? You can omit it or use a little less. It depends on the extract when it comes to carb counts, but it isn’t a lot as you only need a little bit. I have never heard of vanilla EXTRACT which had sugar in it. If you have extract, it is almost certainly sugar-free. I lot of vanilla extract sold here in the US does have sugar added. And, it’s usually a form of sugar, not real sugar. Vanilla extract has 0 carbs. 0 sugar. Depends on the brand. You have to check labels. I’ve seen it both ways. I make my own vanilla, but it take about 6 months before you can use it. Vodka and vanilla beans . Would this work in the little Cuisinart ice cream maker? I was wondering the same thing. Did you ever try it? Is it 94 calories per serving? Or 322? It’s pretty calorie dense so more like 300. We made this yesterday and it was soooooo good! 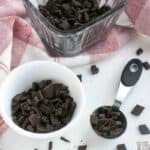 I’ve been craving soft serve chocolate ice-cream and this recipe really hit the spot. Glad you enjoyed this yummy frozen chocolate treat! 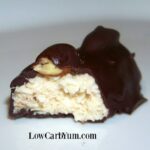 Kimberly, there are 9 grams of carbs per serving in this recipe. How many carbs are in this per serving? I’m on a no sugar low carb diet and I can’t have more than 20 carbs a day. You have to be very careful with heavy cream. Many have .4g carbs per tablespoon. The carb count can vary by brand of ingredient so it’s good to check the brand using. Personally, I would cut the recipe in half or fourth if doing under 20g per day. Your calorie count is unfortunately way off. The heavy cream alone is 51-52 calories per Tablespoon. My calculations, not including any calories for sweeteners is over 340 calories per serving, if indeed this is single serving recipe – a far cry from 94! Those merely watching carbs can rest in a low number, but those of us who also keep an eye on calories would be in big trouble using your numbers. Thanks! I am allergic to almonds. Can I use skim milk in place of almond milk? Yes. You can substitute regular milk or use coconut milk if you are okay with that. I used coconut milk in place of almond milk and it was AMAZING! Thanks so much for posting! Please don’t quit blogging. 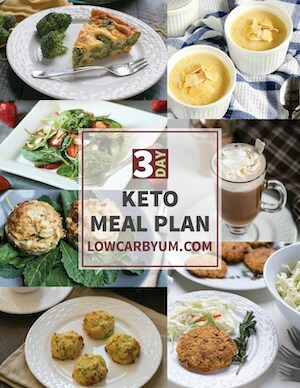 I was diagnosed with diabetes 2 weeks ago and have been looking for lo-carb recipies. I just found your blog last night. I am looking forward to trying your recipes and seeing more of them. I do plan to keep the blog going with new recipes, but just don’t have time to post that often.